Another Independence Day for Zimbabwe? Historic change is in the air with tension and uncertainty mounting as Robert Mugabe's government suffers its first major defeat since he came to power almost three decades ago. The opposition Movement for Democratic Change has won the lower house of Parliament and is set to force a runoff for the presidency. This is the first time there has been a unified election that included candidates for both Upper and Lower Houses of Parliament, local officials and president. The Zimbabwe Electoral Commission (ZEC) has cited the sweep and unprecedented nature of the race as reason for the delay in results. Opposition supporters say the delay is due to the ZEC's efforts to influence the outcome in favor of Mugabe, and stop what may be a historic change in the country. Zimbabwe banned most international media from covering the election, but one reporter on the inside told CNN (on the outside) that things are "eerily quiet," as both sides and their supporters await the outcome. The ZEC maintains that it is still counting ballots from the country's 9,100 polling stations, even though results are already posted at all of the stations and have already been counted by representatives from the opposition and local NGOs. Many groups have charged fraud, saying that the electoral commission has known the results – showing opposition leader Morgan Tsvengirai soundly defeating Robert Mugabe — since as early as Sunday night. Election rules call for a run-off within 21 days if no candidate wins 50.1 percent of the vote. Tsvengirai claims he has won 50.3. Should there be a run-off, Mugabe, who has ruled the country since it gained independence in 1980, would continue to govern in the interim, according to election rules. Most official election observers —from friendly countries only—beat a speedy retreat by Sunday, having pronounced the election "credible," as opposed to "free and fair." So far, the ZEC is sticking to its guns, maintaining that it can verify no more at this point than the opposition's victory in the Lower House of Parliament. Frustrated by the unexplainable delay in announcing the results of all four contests, one opposition supporter joked to me that the ZEC was likely buying time so that the government could shred all incriminating documents. The longer the counting drags on, and the more the rumor mill churns, the greater the potential for instability—instability that could lead to a state of emergency being declared and the military staging a coup d'etat. But the feedback I've gotten from people inside suggests that the generals, who had earlier insisted they would only salute Mugabe as their commander-in-chief, are perhaps becoming resigned to their leader's defeat. It is reported that one of the things that has helped move the generals is the prospect that opposition candidate, Simba Makoni, who left the ruling party to run for President and who came in way behind Tsvengirai, might be brought in to the new government in some capacity, perhaps re-establishing the post of Prime Minister that Mugabe abolished. Makoni served on the powerful politburo of Mugabe's ZANU-PF and had some heavy-weight backers in the party supporting his candidacy publicly and maybe even more quietly. Should he be offered and accept a role in the new government, he may be an important bridge between Tsvengirai's people and Mugabe's. Nkosana Moyo, a Makoni spokesman here in Johannesburg, told me that was not outside the realm of possibility, since Makoni was interested in unifying the country to save the country. For now, rumors are dominating the discussion. There is talk that Mugabe will step down by the weekend. He has not been seen publicly since since he voted last Saturday. And it is not clear if he has heard the calls from the likes of Archbishop Desmond Tutu to "step down with dignity." Mugabe is a proud, if not stubborn, man and may feel that to participate in a runoff which he is likely to lose is too demeaning. After all, his supporters reason, he helped liberate the country from colonial (Rhodesian) rule. It is true that many loyalists hold him in eternal esteem for that. But there are many others who give him credit, and also see the country staring into the economic abyss and believe it's time for a change. 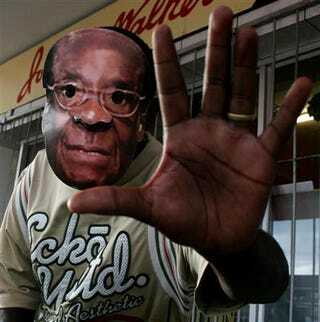 Some analysts say it is too early to count Mugabe out. He is one of the wiliest politicians on the African continent. Many people I've talked to say that this is the moment for regional engagement to help avoid destabilization and "Kenya-type" violence. Few believe that could happen in Zimbabwe, but few would have believed it could have happened in Kenya. So far, the 14-nation Southern African Development Community (SADC) – made up of the area's regional leaders — have been publicly silent, including South Africa's Thabo Mbeki, who has been engaging with both sides since the last disputed election. He and Tanzanian leader, Jakaya Kikwete, are said to possibly be in contact with the aging leader, but there are no reports of what exactly "in contact" means. Former Mozambican president Joaquin Chissano is also believed to be in Zimbabwe consulting with President Mugabe. For many the mood is hopeful. People have said this is a historic moment, that we are witnessing Zimbabwe on the threshold of a new era, a second independence. Trevor Ncube, a publisher whose independent newspaper in Zimbabwe was shut down by the regime, wrote in the Mail and Guardian, the paper he owns in Johannesburg: "This time the people's yearning for freedom appears to be greater than any other force." Charlayne Hunter-Gault is a regular contributor to The Root.